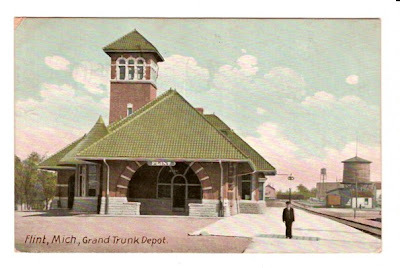 Flint's Grand Funk Railroad, pictured above in the seventies, should never be confused with Flint's Grand Trunk Railroad Depot, featured below in 1909. To make sure you differentiate the two, check out the GFR video below, where Flint's most famous band besides Dissonance does all the things a band from Flint should do — rock out, shoot blow guns, play basketball, pet a pretty horse, ride motorcycles without shirts, and...water ski in cutoff jean shorts? When is waterskiing in cutoff shorts NOT a good idea?! And that picture could be the greatest publicity photo ever. How did that come about? "Hey guys, I'm envisioning something... naked...with flags." Farner and my Family are neighbors, up here in the Tundra(north of Traverse City), and he's a down to earth and Generous man, and His Lovely Wife Lisa is a world Class Lady. Mark hired me and my Wife to do his clothes for the Funk's last Reunion Tour. They did the Leno show, Mark sitting next to Jenny McCarthy holding a python, while wearing a vest I made Him. He's good People in my book. Glad He made it out of Flint. You have to give us some more info after a comment like that. How'd you get into creating clothing for famous bands?